Bayern boss calls for video technology after controversial loss to Real – Royal Times of Nigeria. Bayern Munich coach Carlo Ancelotti said UEFA must swiftly introduce video technology after the Germans lost a controversial Champions League quarter-final second leg to Real Madrid in extra time on Tuesday. Cristiano Ronaldo scored a hat-trick to become the first man to score one hundred Champions League goals as holders Madrid completed a four-two win on Tuesday, going through six-three on aggregate. However, the Portuguese’s second and third goals were offside, whilst visitors Bayern had Arturo Vidal sent off five minutes from the end of normal time. 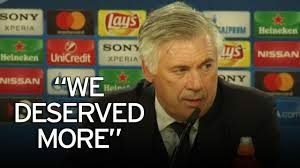 Ancelotti also said referee Viktor Kassai “was not up to the task” of a Champions League quarter-final. He said Real manager Zinedine Zidane agreed with his assessment of Hungarian referee Kassai’s “negative” performance at the Bernabeu. Video assistant referees are being trialed worldwide, with Fifa president Gianni Infantino keen to employ the system at the 2018 World Cup in Russia. Uefa has not committed to the trials but in a statement said it is “constantly looking at ways in which it can improve the matches taking place in its competitions”.